Automatic conveyor systems can be designed and built to move product of any form to and from the granulator processing it. Conveyor systems can be designed and built which include cyclone fines separators, ferrous and non-ferrous detection and removal systems, scanners, counters and product blowers to transport granules throughout a plant. 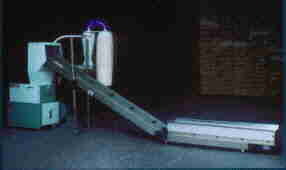 Shown here is one such conveyor system. 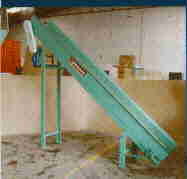 Shown here is another such conveyor system with a completely different configuration specifically designed to solve the customer's particular needs.